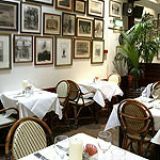 Palm Court Brasserie in Covent Garden serves a popular range of French and Mediterranean cuisines in a stylish and comfortable setting. What did you think of Palm Court Brasserie? The waiters were friendly and attentive without being obtrusive. The food was excellent and everyone enjoyed their chosen dish. There was a variety of dishes to suit all tastes. Excellent value for money. Memorable evening in Covent Garden's Palm Court Brasserie Not my first visit - so I knew what to expect - and was not disappointed. As before, the food and wine was great and the service was faultless. As this lovely little 'french/european' restaurant is situated in the centre of what many tourists will sadly discover is rip-off central in the West End we are lucky to have discovered it's charms. Food menu is broad and thought has obviously been taken with the wine list. Prices are good for the quality of food as well as the excellent service you'll be treated to. Having already pencilled in what we will be eating and drinking next time round - we'll be back. Prices are pretty reasonable, especially when they've offers on BUT if you're vege think again..... their vegetarian main course options are actually a little embarrassing in their rubbishness (the med' vegetable thing was second-rate school dinner slush!) Vegetarians should expect more of London restaurants than some peppers smothered in a tasteless tomato and pepper sauce. Service was fine and central location all good but I'd not go back! What a find...walked past it a hundred times over the years but never been in before.....its lovely. Very welcoming atmosphere, friendly staff and excellent food. Have already booked for my next visit!!! I really enjoyed this place....the atmosphere is so cozy, which, in this weather is very welcoming. The service was superb and the food really delicious. the moules were perfect as was my wife's haddock. Service very efficient too. Will definately go back. Loved this place. Friendly waiters, lovely food (I had seabass, friend had pork), the best french martini I've ever tasted and a lovely atmosphere. Fantastic! Worthwhile going to if you get a deal - think we had three courses (plus glass of champers) for £14.95. Would not eat there if I had to pay the full price. I would definitely not recommend Palm Court Brasserie as they have very small portions when ordering from the usual menu, which is such poor value for money. It is outrageous how busy the place is and I think that the location alone is carrying it. My steak was served cold, and I had to ask three times for our drinks. The pudding portions at Palm Court Brasserie were atrocious. There are so many better places out there, steer clear! 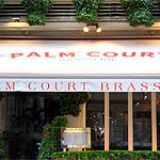 I would not recommend Palm Court Brasserie - they didn't have our booking for 8 for lunch! Although they offered us a round of free drinks in their sister restaurant nearby while we waited, I wish we'd not bothered. My friend & I ordered off the fixed price menu and when 5 chips and a piece of chicken came out, we were very disappointed compared to the big portions our friends received. We were told it was good value for a fixed price menu! That's not the point! So we demanded a free bowl of fries to go with it. It went from bad to worse with the vegetables side order being miniscule for £2.95, the apple crumble & custard came out cold and had to be sent back, the toilets were a mess with no loo roll. Then it was also cold sat by the door with it being wide open, they got our bill wrong. To top it all off, the Palm Court Brasserie manageress was very rude and did not care about our problems. She was more concerned with keeping the coach party of Italians happy, not those who might have returned if we'd had a good meal. Palm Court Brasserie is lovely! Fab staff and great food! We came across Palm Court Brasserie after looking for a nice place for an evening meal, and we were very glad we did! The staff were attentive and took our coats, and continued their hospitality through the course of the meal - refilling our wine glasses constantly! The food is delicious; I had the chicken breast while my boyfriend had the swordfish. I would recommend however that if you're not having a starter that you order a side dish as the main dish might not be big enough for the larger stomach! The best pudding on the menu is the chocolate brownie! The wine was also fab. I definitely recommend this restaurant! Maybe my worst experience ever! The £9.95 menus attracted me, and we were only thinking spending this money and nothing else! First we had a table close to the kitchen and during the dinner we had the sound of spoon and forks thrown (cling cling!!). The waitress then come to ask us if we wanted something to drink and when we asked for only tap water her way of behaving toward us changed! It’s easy to understand that they will be cheerful to you only to make you spend money! Then the food arrived, portions were very small! I had the broccoli purée, which was hot on the outside, cold in the middle! We then paid the bill without having any thanks or greeting! The worst restaurant experience ever! Palm Court is a dependable French-chic brasserie in Covent Garden. It’s perfect for a catch up with friends over classic French dishes, or to enjoy a pre-theatre menu dinner. 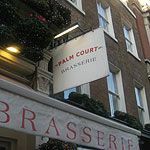 Located on King Street, just a juggler’s ball throw away from the buskers and tourist crowds of Covent Garden, Palm Court is a French-inspired restaurant that is parfait, as they would say on the continent. The décor is decidedly French retro, with old school adverts for Côte d’Azur aperitifs decorating the wall and wall-length mirrors fringed with mini palm trees. Wicker chairs continue the Riviera theme, whilst a long leather bench offers more comfortable seating. A large chandelier hangs from the rich burgundy wooden ceiling; the candles flicker to create subtle low lighting that makes everyone look like a French movie star. 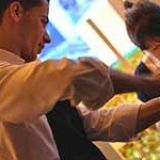 Staff are smartly dressed in full-length aprons with a dark coloured tie; they are happy to make wine recommendations, and are attentive at refilling water or clearing away plates without being overly present. There’s not much space for them to navigate between the tables, but staff seem to move with ease and serve food promptly. Petite casserole of clams, mussels and chorizo (£7.95) is served in a traditional cast iron pot with a basket of warm bread on the side. Small pieces of onion sit in the clam and mussel shells, whilst the chorizo adds an earthy, full bodied flavour that contrasts with the delicate shellfish. Whole tiger prawns are pan-fried in garlic butter (£7.95), although the butter could have been a little subtler and the rocket leaves are too bitter. Homemade tapenade (£2.25) is a pièce de résistance; a hard edge of capers fuses with black olives, lightly flavoured with thyme. You can’t go wrong with the classic steak frites (£16.95), served with a choice of Béarnaise, green peppercorn, or Roquefort sauce (£1.50). The steak is slightly over-cooked, even when asked for rare, but otherwise it is a tender piece of good quality meat. The chunky chips look like oversized divas next to a bowl of skinny French fries, but they are delicious, fluffy and crisp on the outside. A side portion of green beans (£3.25) are perfectly cooked, if a little heavy handed on the butter. Salad Niçoise (£13.95) might be a healthier option, but it is just as filling. A generous slab of seared tuna steak commands respect atop a pile of crisp green beans, soft boiled egg, slithers of red onion and olives. The caper berries are a surprising and delicious addition. French Fries (£3.25) are dense with potato on the inside, but a little chewier than they should be. Other main courses include a selection of pasta from £8.95, a stunning whole Cromer Crab served chilled with mayonnaise and French fries (£14.95) or iron-rich grilled calves liver with mustard mash (£13.95), plus a selection of daily changing specials. Dessert (all £4.95) showcases the usual suspects; crème brûlée, panna cotta or dark and white chocolate terrine. The Pavlova has just the right balance of sweet meringue, clotted cream and tart black berries. The meringue is too dry in the middle, but did have a gloriously sticky bit at the bottom. Balls of vanilla and chocolate ice cream and a ball of mango sorbet arrive in a tuile basket. The mango sorbet tastes more perfumed than fruity, but the vanilla and chocolate ice cream are good. The wine list is predominantly European, with a few New World wines elbowing their way in too. The citrus notes of the Venezie Pinot Grigio pair well with fish (£5.25 per glass or £18.95 per bottle) and the Australian Shiraz (£5.80 per glass or £20.95 per bottle) is velvety and fruity with the steak. Sparkling and Rose wines are also available, and the Kir Royale (£4.95) is an elegant aperitif. If you can’t decide between drink and dessert, Palm Court’s dessert cocktails offer a potent alternative (£5.95). The Espresso Martini packs a vodka and kahlua fuelled caffeine punch, whilst the Golden Cadillac is a softer cocktail, flavoured with crème de cacao and cream. Digestifs are available from £4.70 and tea, coffee and fresh herbal infusions start at £2.25. 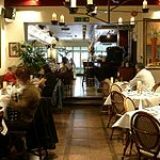 You know what you’re getting at Palm Court Brasserie; good service, classic French cuisine and a twist of Riviera style.